Husky Teardrop Rack & Wire Pallet Racks | T.P. Supply Co. If your business needs pallet racks or other storage systems that sport high-quality construction, finding a reputable brand to procure them from is vital. T.P. Supply Co. stocks and sell Husky & Wire pallet racks to businesses throughout the United States, Mexico and Canada. Not only will you be receiving products from a top manufacturer of more than 50 years, but we'll use our decades of experience to understand your unique circumstances. We like to handle all our affairs in-house, so we're prepared to go through every step of the process with you. What Does Husky & Wire Offer? You will receive 48- to 72-hour QuickShip on every Husky product you purchase from T.P. Supply Co., and bulk order pricing is available to clients who call us or complete our online contact form. Forged from top-tier materials, you'll be getting a sturdy storage option that's competitively priced among other manufacturers. Teardrop Rack: Utilizing the most popular beam attachment system in the country, the Invincible series features two teardrop punches, side by side on 2-inch centers. The beams are adjustable every 2 inches, and they possess the patented Bowlock safety clip to keep them structurally sound. As an industry standard, these systems are compatible with most other products on the market. Upright heights can range up to 46 feet. Standard colors are green uprights with orange beams, but you can choose from other options, as well. 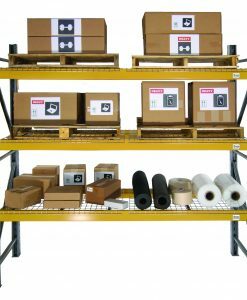 Double-Slotted Rack: While not as familiar as the Invincible Series, Husky's Lynx Rack is still one of the more popular pallet rack systems in the country. 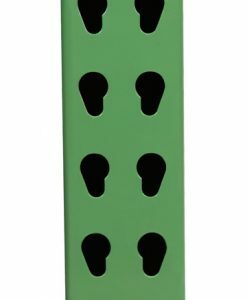 The double-slotted posts on 3-inch centers allow for beams to be vertically adjusted whenever you need it. They're compatible with other manufacturer products, too, which makes finding a good overall solution much more manageable. 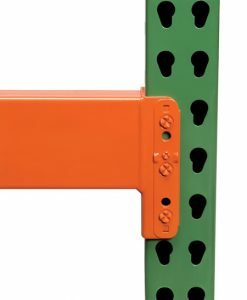 Husky's double-slotted racks also feature sturdy safety pins to keep the unit in one piece, and every part is formed with high-strength U.S. steel. Standard colors are gray uprights with yellow beams, but multiple other options are available. Wire Deck: Husky & Wire is one of the only pallet rack manufacturers that produces its wire decks. When you order a wire deck to complement your teardrop or double-slotted rack, you'll be receiving a guaranteed fit. Coated to withstand chemical damage, rust and other forms of corrosion, these decks will provide an even, reliable level for stored merchandise for long periods of time. We can also order decks that fit preexisting racks from other providers thanks to a range of customizable options. Our Husky products fall into three different categories: new, used and reconditioned. These classifications allow us to offer solutions that suit any budget and collaborate with you to create the ideal course of action for your unique needs. Finding the Right Solutions Through T.P. Supply Co. When you want to buy Husky rack and wire shelving systems come from an excellent source, T.P. Supply Co. should be the ones to connect you. Not only will we assist with sales service, but our trusted employees will aid in delivery, construction and installation. Contact us today to begin the process.